Hunting of brown bears was banned in 1982. Since then the sighting of the bears has increased---from 41 in 1993 to 489 in 2003---and there has been more potentially dangerous encounterers. Because they are no longer hunted brown bears don’t fear people like they used to. They no longer are fazed by noise makers, whistles or bells and have made half -hearted charges at tourists. In 2004 some footpaths were closed because of worries about bear attacks and elevated walkways were built to protect tourist in the future. Bears have been blamed for destroying apple and permission orchards. They are particularly fond of persimmon and often raid crops in places where there is thick bush for them to hide and the population is made up primarily of relatively non-threatening elderly people. A study of bears in Tochigi prefecture found that bears there lived mainly on persimmons and cherries from village orchards rather than nuts found in the mountains. Though usually shy and cautious animals, Asian black bears are more aggressive toward humans than the brown bears of Eurasia[ and American black bears. David W. Macdonald theorises that this greater aggression is an adaptation to being sympatric with tigers. According to Brigadier General R.G. Burton: The Himalayan black bear is a savage animal, sometimes attacking without provocation, and inflicting horrible wounds, attacking generally the head and face with their claws, while using their teeth also on a prostrate victim. It is not uncommon to see men who have been terribly mutilated, some having the scalp torn from the head, and many sportsmen have been killed by these bears. A Dr. E. T. Vere of Srinagar, Kashmir wrote of how his hospital received dozens of black bear victims annually. He wrote that, when attacking humans, black bears will rear up on their hind legs and knock victims over with their paws. They then make one or two bites on an arm or leg, then finish with a snap to the head, this being the most dangerous part of the attack. There are no records of predation on humans by Asiatic black bears in Russia and no conflicts have been documented in Taiwan. However, in India, attacks on humans have been increasing yearly, and have occurred largely in the northwestern and western Himalayan region. In the Chamba District of Himachal Pradesh, the number of black bear attacks on humans have gradually increased from 10 in 1988-89 to 21 in 1991-92. Recent bear attacks on humans have been reported from Junbesi and Langtang National Park in Nepal, and occurred in villages as well as in the surrounding forest. Li Guoxing, the second person in history to have received a facial transplant, was a victim of a black bear attack. Bear attacks have been increasing in Kashmir since the Kashmir conflict. In November 2009, in the Kulgam district of Indian-administered Kashmir, a black bear attacked four insurgents after discovering them in its den, and killed two of them. The majority of attacks tend to occur when black bears are encountered suddenly, and in close quarters. Because of this, black bears are generally considered more dangerous than brown bears, which live in more open spaces and are thus less likely to be surprised by approaching humans. They are also likely to attack when protecting food. Wildlife officials say that there had been a substantial increase in wild animal population in Jammu and Kashmir as poaching and hunting has stopped in Kashmir with the rise of terrorism. They say that the human interference in the wild animal habitat has also increased and many forested areas have been denuded, which force the wild animals to stray into villages. They say that many areas, where wild animal usually inhabit are covered under snow and these animals come down to residential areas in search of food. Nine people were killed by black bears in Japan between 1979-1989. In September 2009 it was reported that a black bear attacked a group of tourists, seriously injuring four, while they were waiting at a bus station in the built-up area of Takayama, Gifu in central Japan. AFP reported: “A black Himalayan bear killed an 18-month-old boy in a zoo in the Pakistani city of Lahore on Sunday, police said. The child, who was with his parents, tried to shake hands with the caged bear. But the animal pulled the boy into the cage and tore him apart, police said. Witnesses said the boy died in front of his screaming parents. An angry crowd tried to kill the bear but police intervened to bring the situation under control. A zoo official blamed the parents for allowing the boy to touch the animal. 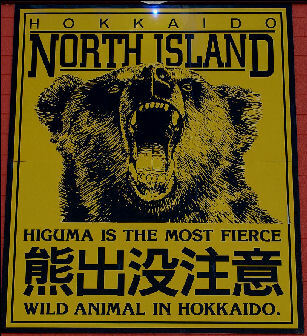 People have been killed by bears in Hokkaido and the Tohuku region of northern Honshu. In May 2001 in southern Hokkaido, a 53-year-old man was killed and buried by a bear. In 2003, a man was badly mauled in the face by a bear in the Okayama area. Two deaths from bear attacks were recorded in both 1985 and 2004. In October 2005, a zookeeper died after being mauled on his head and leg by a brown bear at the Fuji Safari Park in Shizuoka. In November 2008, a bear attacked a woman at a vacation home in Karuizawamachi, Nagano Prefecture, leaving her with minor back injuries. The beare attacked the woman after jumping out of thicket of bushes and is believed to have been a cub that had just left his mother. In September 2009, a black bear attacked nine people at a bus terminal in a mountainous area of Takayama in Gifu Prefecture. Four people were hospitalized with injuries such as bite marks to the face but none were in serious condition. More than 100 people were at the bus terminal at the time. Many of the bear attacks have been blamed on a shortage of acorns due to typhoons and other bad weather which forced the bears into populated areas in search of food. A campaign organized by a group called the Bear and Forest Association aimed to collect acorns from parks in the cities to help feed the bears. Allowing fields to become fallow and overgrown and the bluring of the areas of the region that demarcated the forest and farms have also contributed to the problem. This has encouraged bears to move nearer to where people live. In 2005 there were plentiful food supplies in the mountains and relatively few bears caused mischief in places with large human populations. The number of bears trapped or killed because they were deemed as pests was less than 1,000.